I was originally planning on going to somewhere on M Street for lunch, but when I saw the tables both inside and outside of California Grill packed, I had to try it. 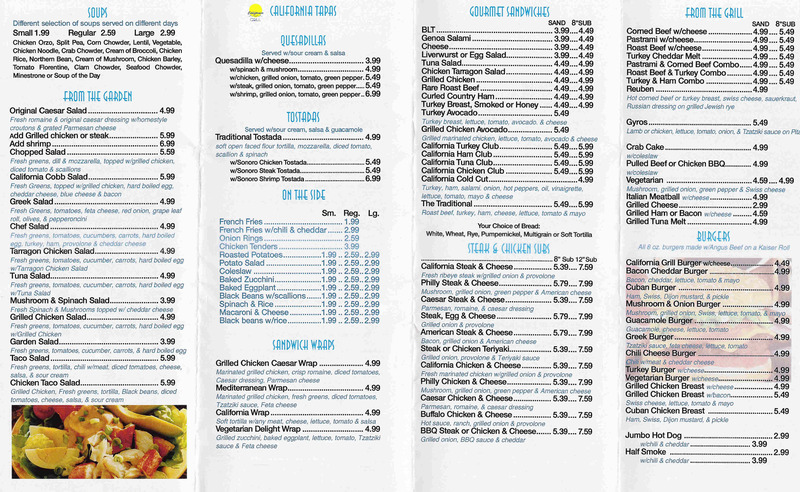 And of course, watch out because there’s a California Grill on Vermont Ave too! Food:I ordered their special, the beef burrito, which was pre-made. I rarely order anything that’s pre-made and I was reminded why. You can see the photo for yourself. I can’t lie — it was horrible. The salsa was really sweet and had this weird tang. The beef was hard and overcooked. The rice was also overcooked. While it may have been $5, I would have much rather eat a $5 from the new burrito cart guy. So since I had such a dismal experience the first time, I had to go back and try it again. This time, I ordered their turkey Reuben and while it was good, I think So’s Your Mom is better. Service:They are really nice. 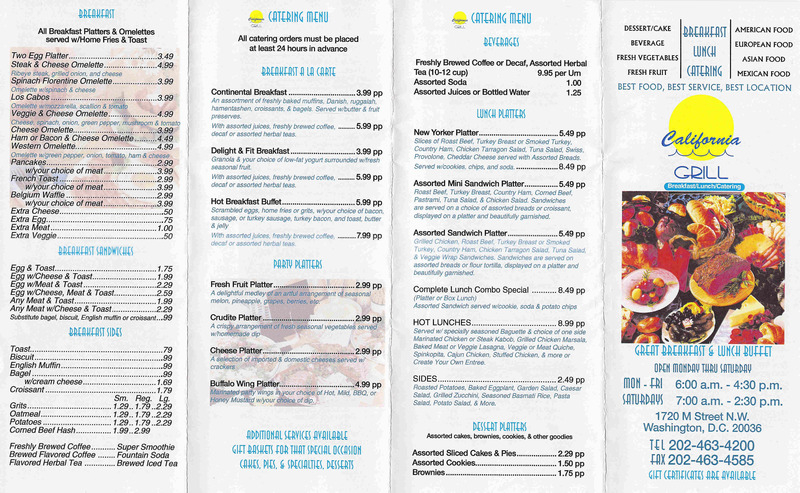 Depending on what you want to order (salad, sandwich, pre-made, etc. ), you order from the guy behind the right sign at the counter. Atmosphere: Inside it reminds me a bit of a Wendy’s (I think — it’s been so long since I’ve been in one!) with their light wood panels. It’s a pretty big restaurant so they have a lot of seating inside. They also have 4-6 tables outside. Overall: If your office is super close, I can see going here a lot since they are so nice and they serve decent sandwiches. For the days you’re in a rush, they can make your sandwich and get you out in less than 10 minutes which is great. Readers know how much I loved the Burrito Cart Man who lived in front of the CVS on K and 15th Street. So I was walking around one day trying to figure out what to eat for lunch and found a burrito cart man on the corner of K and 17th Street (by Farragut North Metro, Dress Barn, and Starbucks). He’s the green cart. Now I know he’s been there for years, but I had never tried his cart. For $0.50 more, you can get guacamole (not homemade) or cheese. For $0.25 you can get sour cream. So while he has only 7-9 hot sauces that are either medium or hot, his burritos are the closest I’ve had to the original burrito cart. But his are definitely not the same. He has no salsa on the burrito so that means no big chunks of onions, tomatoes, or cilantro. He does put the tortilla into the steam heat so it’s hot, but he doesn’t throw the cheese on until the end (but it does still melt). While they’re not the same, it was a decent burrito for $5. I cannot believe this is happening. The Burrito Man will no longer be operating after November 20th. You better grab a couple of burritos on Monday and Tuesday as they will be your last. But the good news is this — if you email him (or give him your businesscard), he’ll send you a burrito kit. He’s looking for someone to help “spiff up” his Web site so he can take burrito orders and send you a kit from NC. Thank goodness we can still get our burrito! This might be the worst day ever (OK, exaggerating). But, I just read in DCist that the Burrito Man (see here for my ode to his fantastic, cheap burrito) might be closing down unless he can find a new Burrito Man. See here for the story on why he’s moving. Apparently, the guy who was going to take the title has disappeared. Why do you toy with our emotions new Burrito Man? Come out of hiding! You may remember my ode to the Burrito Man. Well, DCist says that Burrito Man #1 will be handing off his cart to Burrito Man #2 AND moving to 14th and L.